Wow what a great turn out last night at the "Outdoor You" meeting in Sussex. Lets hope we can establish something from all that energy and interest. At the meeting there was discussion about gaiters and coincidentally I was reading a web article on just that earlier yesterday. The article is brief and shows how to make your pants into a gaiter. This is great but sometimes you want a gaiter to protect your clothing (pant) layer. I have a suggestion on how to make a pair rather than buying them. I like to shop at Frenchy's, or your local discount clothing store, to get my hiking and work clothes. It is cost effective and sometimes you can find great quality stuff there. For the task of making gaiters though all you need is a pair of gym pants with an elastic cuff, or a coat with elastic cuffs. The elastic cuffs are the key here, not necessarily quality. Also, look for something where the cuff will stretch sufficiently to cover the top of your hiking boot. Cut the leg off the pants, or arm off the coat you find. 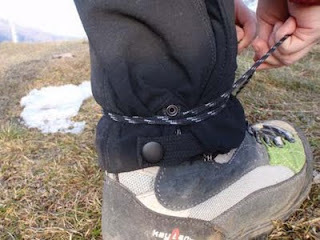 Poke a hole, just above the elastic cuff, in what will be the back of your gaiter and thread both ends of an old bootlace through it, leaving a loop. Now poke a hole on each side of the gaiter, two thirds to the front, and thread each end of the lace through these holes. This completes the lower portion of the gaiter. For the top, simply loop a lace around the opening in a manner that will allow you to slide your leg through it. Fold the trimmed end of your cut off pant leg or coat arm over the lace a couple of times and voila, gaiter complete.